The objective was to recruit an entire EMEA finance function of 8 FTE’s over the course of an 18-month period. The roles that made up the assignment ranged from the Group Controller, Head of Commercial Finance and Finance Manager all the way through to transactional finance. 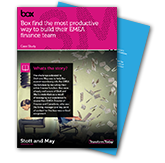 But Box were not just looking for a ‘typical finance candidate’. Whilst academic ability was a core requirement, they had a vision to scale a finance team at pace filled with individuals who could act as a true partner to the business in the pursuit of top line performance. Read the case study to find out how we made it happen.